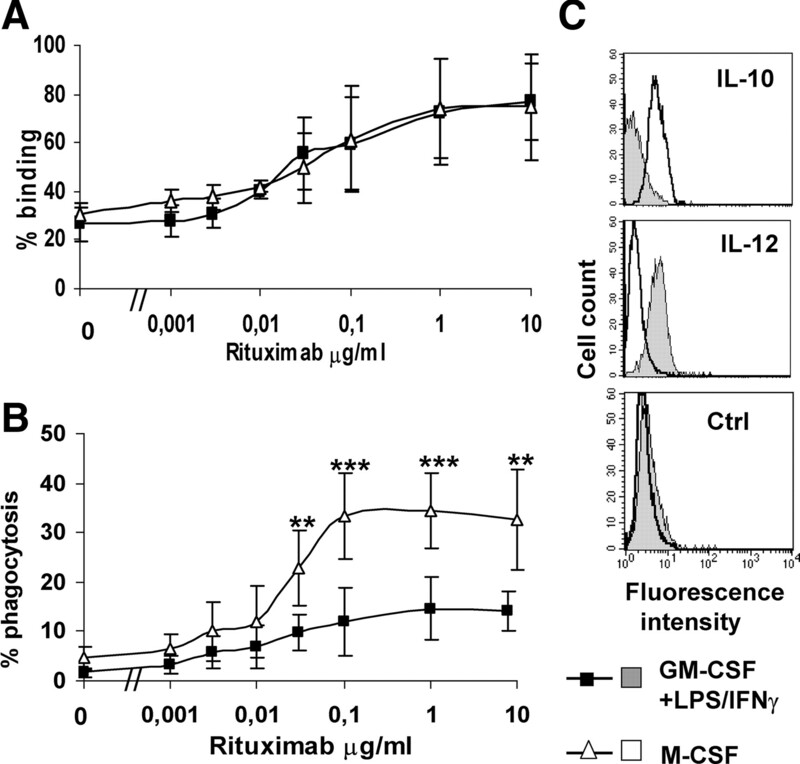 Macrophages bind specifically to rituximab-opsonized B-CLL targets. A, Example of binding assay. B-CLL cells were labeled with CFSE and stained with 1 μg/ml rituximab. M-CSF-differentiated macrophages were incubated for 5 min at 4°C in presence or absence of CFSE-labeled target cells (1:1 ratio), detached, and stained with anti-CD11b PE Ab. The percentage of double-positive macrophages with respect to total macrophages is shown in each panel. 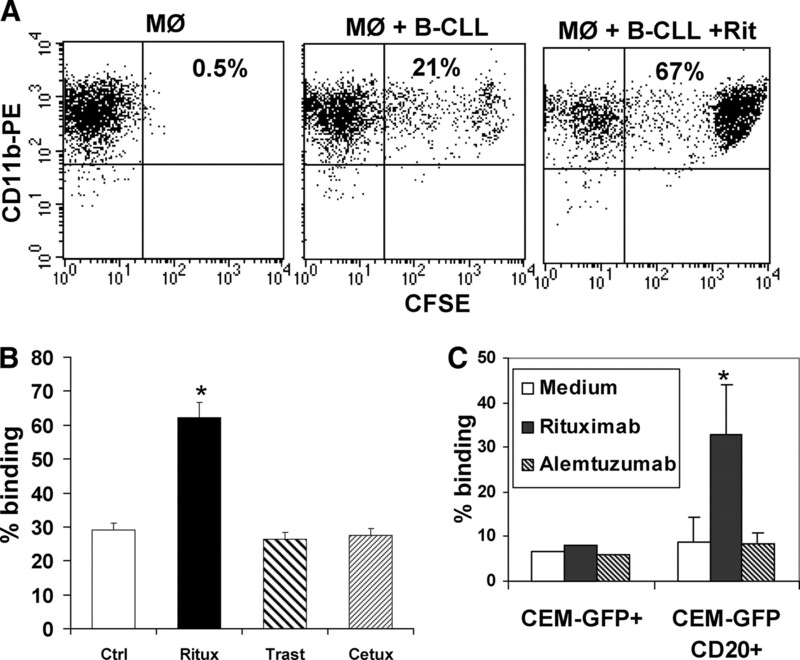 B, Results of binding assays using macrophages and CFSE-labeled B-CLL target cells incubated with either 1 μg/ml rituximab, trastuzumab, or cetixumab. 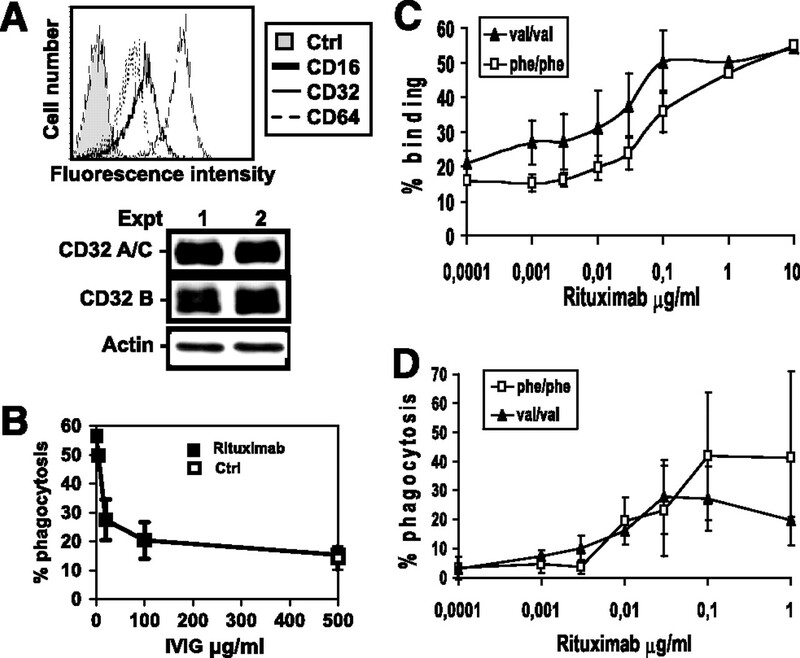 C, Binding assay using macrophages and the CEM GFP+ or CEM GFP+CD20+ target cell lines in presence or absence of rituximab or the control Ab alemtuzumab. The data of B and C are the mean and SD of three experiments. M-CSF-differentiated macrophages phagocytose rituximab-opsonized B-CLL, but not BJAB cells. Macrophages differentiated in vitro with M-CSF were used in binding (F) or phagocytosis assays (A–E and G) using B cell targets opsonized with rituximab or control Abs. A, Macrophages only; B, macrophages + B-CLL + 1 μg/ml trastuzumab; C, macrophages + B-CLL + 1 μg/ml rituximab; D, macrophages + BJAB + 1 μg/ml rituximab. E, Percentage of phagocytosis of B-CLL cells in presence of 1 μg/ml rituximab or control Abs trastuzumab and cetuximab. F, Dose-response curve of binding, using macrophages (▪) or monocytes (▵) and B-CLL targets incubated with increasing concentrations of rituximab. G, Dose-response curve of phagocytosis, using macrophages (▪) or monocytes (▵) and B-CLL targets incubated with increasing concentrations of rituximab. Data in E–G are the mean and SD of three experiments. Statistical analysis: ∗, p < 0.05; ∗∗, p < 0.01; ∗∗∗, p < 0.001. 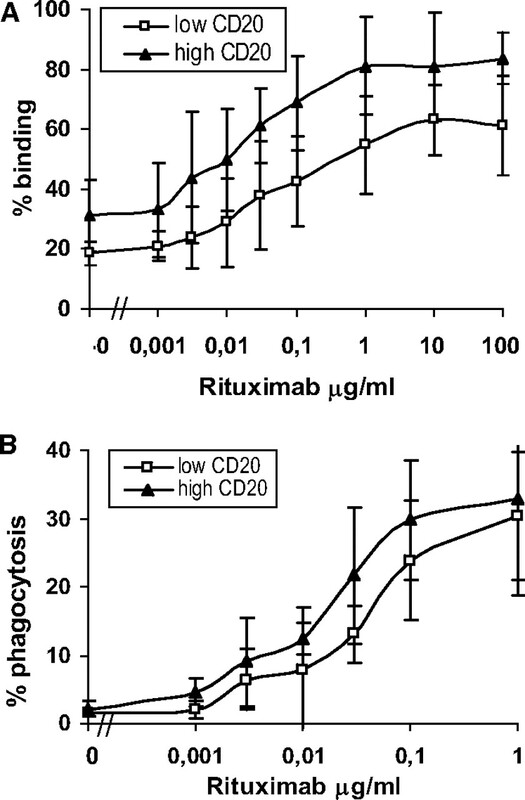 CD20 levels do not affect phagocytosis. Macrophages differentiated in vitro with M-CSF were used in binding (A) or phagocytosis assays (B) using B-CLL/MCL targets expressing either low levels (mean MFI 91) or high (mean MFI 457) levels of CD20. The results are the mean and SDs of three independent experiments. Role of FcγRs and CD16A polymorphism. A, Expression of CD16, CD32, and CD64 on M-CSF-differentiated macrophages was analyzed by FACS (upper histogram), and that of CD32A/C and CD32B in M-CSF-differentiated macrophages from two donors in Western blot (lower panel). B, Phagocytosis of rituximab-opsonized B-CLL (▪) was performed in presence of increasing concentrations of human Igs (intravenous Ig IVIG). Control (□) was in absence of rituximab and presence of highest dose of IVIG. C and D, Monocytes were purified from donors homozygous for the Val/Val (▴) or Phe/Phe genotype (□) at position 158 of CD16A gene and differentiated in vitro with M-CSF. These were then used in binding (C) or phagocytosis assays (D) with B-CLL targets and increasing concentrations of rituximab. The experiments were done in parallel with pairs of Phe/Phe or Val/Val macrophages using the same B-CLL targets. The results are the mean and SDs of at least five independent experiments with at least three different donors for each genotype. 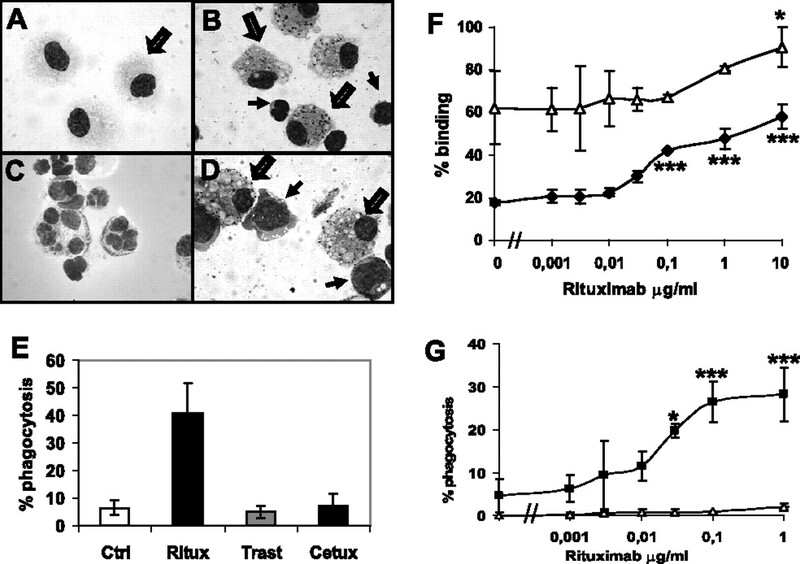 M2 macrophages phagocytose rituximab-opsonized B-CLL more efficiently than M1 cells. Monocytes were differentiated with GM-CSF, IFN-γ, and LPS (M1 cells; ▪), or M-CSF (M2 cells; ▵), and used in binding (A, mean and SDs of three experiments) or phagocytosis assays (B, mean and SDs of five experiments) using B-CLL targets. ∗, p < 0.05; ∗∗, p < 0.01; ∗∗∗, p < 0.001. C, Differentiation toward M1 (gray histograms)- or M2-type macrophages (white histograms) was checked by intracellular staining with IL-10 and IL-12 Abs. 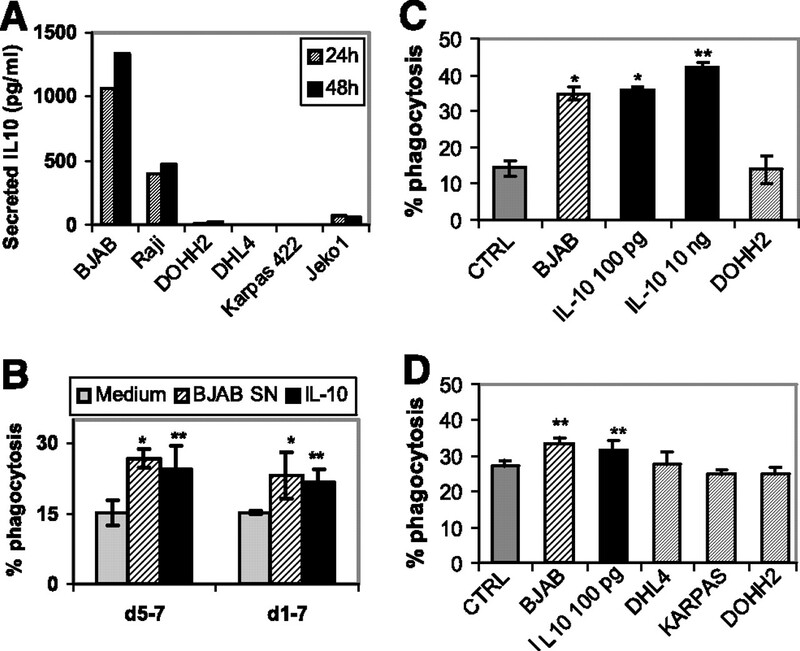 IL-10 increases and IL-4 decreases phagocytosis and FcγR expression by M-CSF- or GM-CSF-differentiated macrophages. 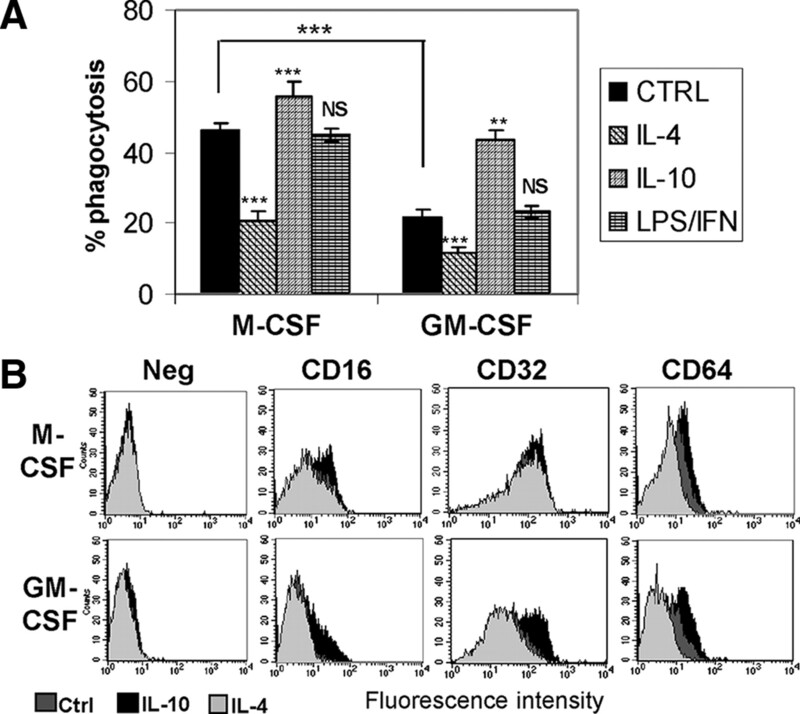 Macrophages were differentiated in chamber slides with M-CSF or GM-CSF for 7 days. A total of 20 ng/ml IL-4 or 10 ng/ml IL-10 was added during the last 48 h. LPS/IFN-γ were added during the last 24 h. Phagocytosis was then assayed in presence of B-CLL and 0.1 μg/ml rituximab (A). Data are the mean and SEs of duplicate wells. Expression of CD16, CD32, and CD64 in the different macrophage populations was analyzed by FACS (B). All data shown are representative of three independent experiments. ), or supplemented with conditioned medium from either BJAB (thick striped bars) or DOHH2, DHL4, or KARPAS 422 (thin striped bars), or supplemented with 100 pg/ml or 10 ng/ml human rIL-10 (▪) during the last 2 days of culture (B, days 5–7, and C and D) or during the whole culture (B, days 1–7). The generated macrophages were then used in phagocytosis assays using B-CLL targets opsonized with 0.1 μg/ml rituximab. Data are mean and SD of duplicate (B and C) or quadruplicate wells (D) and are representative of at least three independent experiments.